We have been hard at work on our Legend of Zelda Spirit Tracks Walkthrough for much of the past several days and we have several chapters available to you all. We have text chapters available for the first seven chapters of the walkthrough. This includes everything up to the third temple of the game, the Ocean Temple, as well as the journey through the Temple of Spirits for the 4th time. However, our walkthrough pages are under heavy construction and they are going to be constantly updated over the next few weeks as we add more text, screenshots, proper formatting, as well as all the various side quests in the game. So stay tuned! The first chapter of our walkthrough is not quite complete, but it’s upwards around 80% complete. This is a short glimpse of what is to be expected by the time the long journey of writing the walkthrough is complete. Check back soon as we will try to keep you all as up to date as possible with Spirit Tracks content. 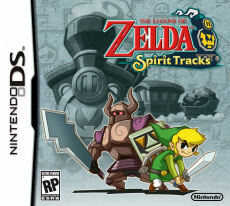 If you would like to discuss the newest Legend of Zelda title, head on over to our Spirit Tracks Forum.